Poor kitchen. She takes a lot of abuse from me. I thought about sizing this picture down, but really, it should be big for effect. I'm not sure how much longer Jesse & I can take it either. Donations are now being accepted for my new studio! You think I'm kidding...but I'm not. Jesse got me a new "saw" this week — takes down small trees like a pro. Small trees don't really fit through the doorway of the "studio" though. 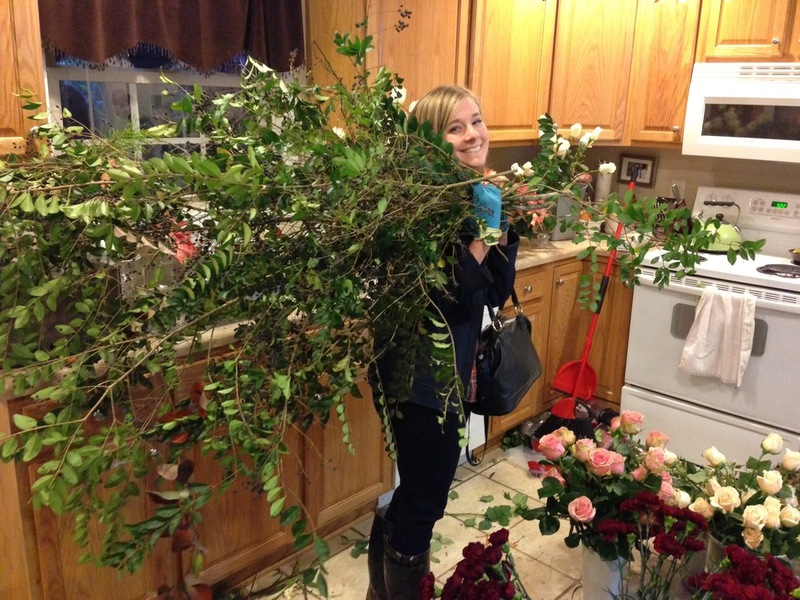 My kitchen might not be pretty, but the poinsettias, peonies, protea, privet, pine and pink roses were. Yes, that's right, today's letter of the day is "P." I miss Sesame Street...and I need a big room to make messes in. From blue mountains to bigger blue mountains!